Heat oven to 450º F. In a square pan, 9 x 9 x 2 inches, melt the butter in the oven. When melted, remove from oven. In a large bowl, measure out all the dry ingredients. When mixed together, add the milk and stir until a dough forms. Turn the dough onto a well-floured board and knead about 10 times. Roll into an 8-inch square. 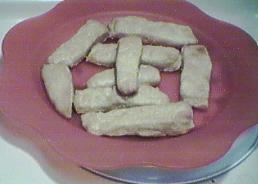 Dip a knife in flour and cut the dough in half, then cut each half into 4-inch strips (9 on each side). Dip each strip into the melted butter in the pan, coating both sides, and then arrange the strips close together in two rows in the pan. Bake 15-20 minutes or until golden brown.